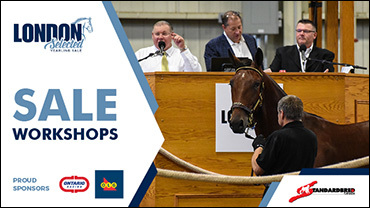 Standardbred Canada, in conjunction with this weekend’s London Selected Yearling Sale, is hosting three educational workshops at the sale, all sponsored by Ontario Racing and Ontario Lottery & Gaming. Horse Ownership 101 – 4:30 p.m. – 6:30 p.m.* ( *later, if staying for racing at The Raceway )- If you are considering purchasing a yearling or racehorse and would like to learn more about understanding pedigrees, conformation, and the owner-trainer experience, this workshop is for you! How To Read & Understand A Pedigree – (9:30 a.m. – 10:15 a.m.) This session will teach you how to decipher all of that valuable info on a yearling’s pedigree page. Conformation Evaluation – (10:15 a.m. – 11:30 a.m.) This session will offer information on what you should look for when inspecting a horse’s physical attributes. One or two yearling inspections will be conducted. There is no cost to attend any of the workshops but registration is required. There are a limited number of seats available for all three workshops. To reserve your spot in any of the FREE Workshops, email kwvlaar@standardbredcanada.ca or contact Kathy or Hailey at Standardbred Canada at (905) 858-3060 x207 or x243.